What changes will make the 2018 Honda Pilot different? Probably very little. Expect the 2018 Honda Pilot to be a virtual re-run of the 2017 Pilot – itself a little-altered continuation of the all-new, third-generation Pilot that debuted for model-year 2016. We would urge Honda to reconsider its distribution of features, so buyers could, for example, get a key safety system in combination with onboard navigation without having to shell out $42,000-plus for an upper-trim model. That sort of democracy would enhance the appeal of what’s already a rare combination of family-friendly versatility, driver-satisfying road manners, and sterling reliability. It’s also the Honda version of the MDX crossover sold by the automaker’s upscale Acura division. Originally launched for model-year 2003, Pilot was one of the first midsize crossover SUVs that could seat up to seven or eight passengers. Today, it ranks third in sales among three-row rivals, behind the Ford Explorer and Toyota Highlander. Even as crossover sales as a whole are rising, buyers are shying away from three-row midsize models. Many in the competitive set are suffering sales declines, including Pilot, which is down nearly 11 percent through the first 10 months of 2016. To see if Honda makes blind-spot alert with rear cross-traffic detection available on more models. Under the automaker’s current policy, the only Pilot with this rather basic safety feature is the top-line Elite model, which has a 2017 sticker price of $47,970, including the $900 destination fee. In a similar policy quirk, Pilots with autonomous emergency braking earn the coveted Top Safety Pick+ rating from the Insurance Institute for Highway Safety. Autonomous braking can automatically bring the Pilot to a stop to avoid a frontal collision. 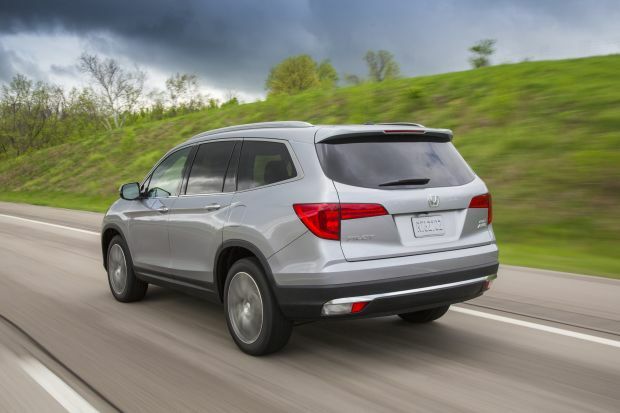 It’s included in the Honda Sensing suite of safety and driver assists, which is standard or available on every Pilot model except the entry-level LX. But as detailed below, the automaker compels buyers of the popular EX-L model to choose between Honda Sensing, a navigation system, and a rear DVD entertainment setup. Indeed, feature packaging is our biggest gripe with the Pilot: the only way to get some desirable safety and convenience items is to spend a bit more than you might otherwise feel comfortable doing. Finally, be aware that model-year 2019 portends a midcycle update likely to bring modest styling changes and perhaps the sort of features re-arranging we’re suggesting. That means waiting for an ’18 Pilot would net you styling details that’ll look a little dated when the ‘19s arrive. Yes, if you’re OK with a sales strategy that could force you to compromise on features to stay within your budget – or stretch it to attain those you want while also getting some about which you may be indifferent. That does not, however, diminish our regard for this crossover or discourage us from strongly recommending you put it high on your midsize-SUV shopping list. Pilot’s 2017 lineup ascends through LX, EX, EX-L, Touring, and Elite trim levels. EX and higher models gained Apple CarPlay and Google Android Auto support for model-year 2017. All again come with a strong, smooth V-6 engine. The Elite comes only with all-wheel drive (AWD), which is optional on the others in place of front-wheel drive. No matter the model, road manners are second to none in the competitive set. Better yet, Pilot doesn’t sacrifice handling prowess for ride quality, even on the Touring and Elite, which come with 20-inch wheels and relatively low-profile tires. Almost certainly not. Any changes to Pilot’s exterior or interior look is unlikely before the model-year 2019 mid-lifecycle freshening. 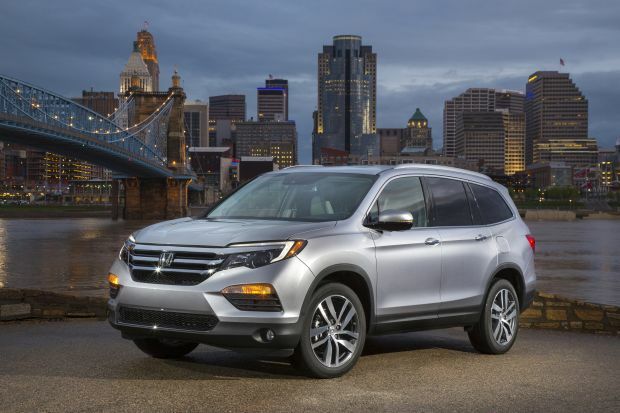 The 2018 Pilot will continue with the styling that debuted with its 2016 redesign. Honda smoothed out the previous-generation model’s sharp edges. You can see the MDX’s influence in several places, along with a front fascia that is reminiscent of Honda’s 2015-16 CR-V compact crossover. Overall, the current Pilot is contemporary if somewhat derivative. The interior design is clean and functional. Passenger room is very good, with Pilot being one of the few vehicles in the class to offer adult-adequate room in the third row. Accessibility to aft-most seating area is decent. Sliding the second row out of the way is made easier with a pushbutton release that’s standard on the EX-L and above, but the mechanism isn’t quite as slick as what you’ll find on the Chevrolet Traverse or Nissan Pathfinder. Kudos to Honda for including CarPlay and Android Auto on most models, but we still long for a discrete audio-volume knob, rather than the temperamental virtual slider mechanism on the infotainment touchscreen. Perhaps this is something the company will address as part of the planned 2019 update. Probably not for 2018. All models should continue with a 3.5-liter V-6 with 280 horsepower and 262 pound-feet of torque. LX, EX, and EX-L models will likely repeat with a 6-speed automatic transmission while Touring and Elite models will retain a more sophisticated 9-speed automatic. As part of its planned 2019 freshening, Honda could scrap the Pilot’s V-6 in favor of a turbocharged four-cylinder. This engine is expected to make its way into the Accord as part of that midsize car’s 2018 redesign. It would produce around 240-250 horsepower and pair with a continuously variable automatic transmission (CVT). The ’18 Pilot will likely retain front-wheel drive as standard on LX, EX, EX-L, and Touring models. Available for around $1,800 and standard on the Elite would be traction-enhancing all-wheel drive (AWD). Depending on consumer demand, it’s possible (albeit unlikely) that Honda could introduce an Elite with front-drive as a more cost-effective way for buyers to get a Pilot with a full suite of safety gear. Not without some mechanical changes. Pilot’s 2017 EPA ratings should carry over: LX, EX, and EX-L at 19/27/22 mpg city/highway/combined with front-wheel drive and 18/26/21 mpg with AWD. The front-drive Touring would rate 20/27/23 mpg city/highway combined. The AWD Touring and Elite (if it remains AWD only) would rate 19/26/22 mpg. In all models, the V-6 can shut off three cylinders while cruising to save fuel. Touring and Elite models benefit further from their 9-speed transmission and from engine-idle stop/start, which shuts off the engine at a stop and instantly restarts it when the driver releases the brake pedal. Most likely not, but again, Honda could surprise us by making blind-spot and rear cross-traffic alert available on other models besides the Elite. Carryover standard equipment on all models should include keyless entry with pushbutton ignition, Bluetooth connectivity, and Honda’s multi-angle rearview camera. EX models add Honda’s LaneWatch blind-spot camera, remote engine start, touchscreen infotainment with CarPlay and Android Auto, and tri-zone automatic climate control. EX-L versions have leather upholstery with heated front seats and a power front-passenger seat. Tourings have unique exterior trim, LED daytime running lights, the Honda Sensing Safety Suite (adaptive cruise control, lane-departure warning with automatic steering correction, and forward emergency braking), driver-seat memory positioning, rear DVD entertainment, and in-dash navigation. 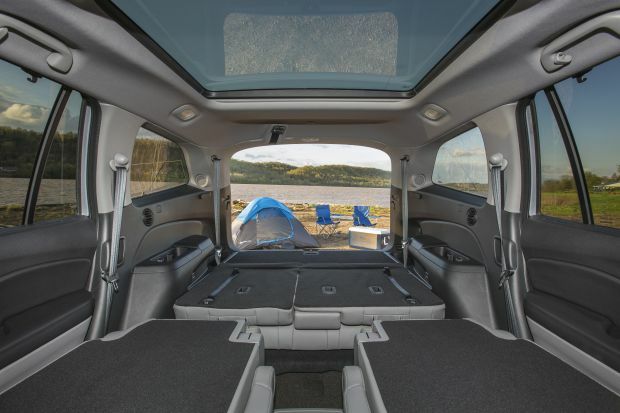 Elites have all this plus ventilated front seats, second-row bucket seats (which reduce seating capacity to seven from eight), rear-obstacle detection, automatic high-beam headlights, blind-spot alert with rear cross-traffic detection, and a heated steering wheel. Honda Sensing has been available on the EX and EX-L as a stand-alone feature that creates EX w/Honda Sensing and EX-L w/Honda Sensing models. Honda also offers the EX-L w/Navi version with an imbedded satellite navigation system that can continue to provide real-time mapping in the absence of a cell signal. A third EX-L variant includes a rear DVD entertainment system. All three are priced as independent trim levels and the only way to get any combination of Honda Sensing, imbedded navigation, or DVD entertainment is to move up to the Touring — a more than $5,000 jump over a standard EX-L – or the $47,000-plus Elite. They’ll likely increase, but not by much. Figure on a front-drive Pilot LX to have a base price around $31,000, including the destination fee ($900 on the 2017 Pilot.) With front-wheel drive, the EX should start around $33,500; the EX-L around $37,000; and the Touring around $42,500. Expect to add $1,800 for AWD. Look for the ’18 Pilot Elite, which will likely remain AWD only, to be priced at $48,000. Among key options, Honda Sensing should still cost an extra $1,000 on the EX and EX-L – the same price as imbedded navigation. Expect rear DVD entertainment to again cost $1,600. Per Honda tradition, these vehicles would be priced as separate models. Expect a 2018 Honda Pilot release date of autumn 2017. No. 1 would be the democratization of safety features, principally Honda Sensing. And we remain baffled that Honda insists customers pay $48,000 or so for the privilege of blind-spot alert, a feature that’s standard on mid-$20,000 Toyotas.